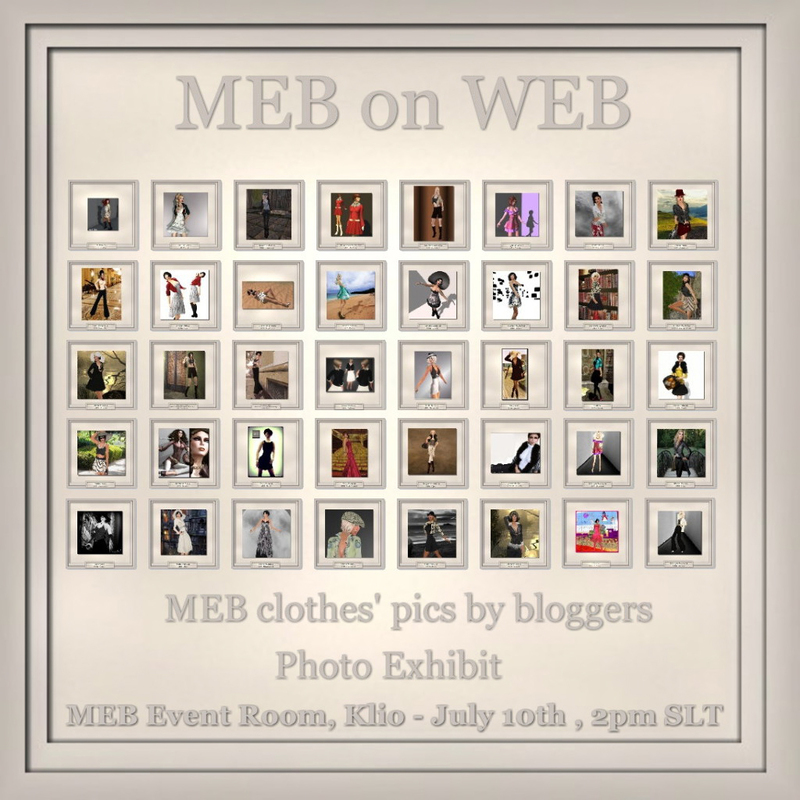 MEB on WEB exhibit displays more than 40 photo that 28 bloggers published on their webpages, reviewing MEB clothes. For the first time, blogger’s pics will be in an in-world exhibit: that will show how much their beautiful pics are influent in presenting designer’s clothes to the widest public. Thanks all of you for making this stunning exhibit possible. The exhibit will open July 10th 2pm SLT at the Event Room of the MEB main store at Klio. presenting also the newest MEB summer outfits. We would be pleased if featured bloggers can give notice of the event on their webpages. Here below a short intro to the exposition. Bloggers make dresses live. Like models on the runway, they propose on the wider runway of the Web a personal styling, a proper background, adequate poses to show designer’s clothes at their best. MEB wants to dedicate an exhibit to this work. Blogger’s pics will show the different way to interpretate MEB clothes and to add them worth. Pics are taken from more than 30 blogs, with their authors’ permission, and they give an exciting view of the MEB large catalogue, along with the witness of the love for fashion that animates blogger’s work. This entry was posted in Events & Contests, Fashion and tagged 3D, 3D people, Art, avatar, Blog, Blogger, bloggers photo exhibiion, Clothing, Couture, Fashion, Fashion in Pixels, fashion poses, Female Clothing, female wear, Formal, formal attire, Hair, High Fashion, Jewelry, MEB, Melusina Parkins, meta virtual, Model, model pose, Model Poses, Modeling, Modeling pose, Modeling Poses, New, New Release, New Releases, News, photo expo, photographer, Pose, Second Life, Secondlife, SL, SL Clothing, SL Fashion, SL Style, Style, vernisage, Virtual World, Wicca Merlin, woman. Bookmark the permalink. I do not even know how I ended up here, but I thought this post was good. I don¡¯t know who you are but certainly you are going to a famous blogger if you are not already Cheers!